The EPSS is definitely greater than two, therefore, the ejection fraction is definitely less than thirty percent, now we are seeing part of a fast scan, the liver is noted to be more anterior, the right kidney is at the tip of this arrow and then Morrison’s pouch is the space in between, now this is a potential bedside sonography space and there is at the tip of the fat arrow, that’s free fluid, it doesn’t belong there, the CBC revealed a profound anaemia so medical decisions were made with these assumptions, this patient did not have a pulmonary embolism as shown by the CT angiography. The new onset of congestive heart failure CHF could be quantified with an ejection fraction that was significantly decreased at less than thirty percent, the anaemia was probably from an inter abdominal bleed, the fast scan showed free fluid and the patient had a very significant anaemia, the bleed might very well be from his DIC and lastly the CHF possibly could be due to askemia from the acute bleed, obviously this would change your clinical management, whether to call surgery for the abdominal bleed, how much fluid to give, many decisions could be made based upon this ultrasound, based upon both ultrasounds so see the next presentation of test your sonography skills to assess your ability to interpret and utilize bedside sonography or see one of the vignettes that we have prepared for you. As an additional part of your ultrasonographic assessment, there was another ultrasound performed and this one of the abdomen and again take a look at this and we will review this in short order as well, now again, to emphasise, there are many approaches to this but based on your ﻿sonography﻿, what findings might change how you proceed, again, this doesn’t mean that we proceed definitively in this fashion but this is to illustrate how an ultrasound can change your clinical judgement as to what is exactly going on in this case, let’s review this ultrasound of the heart, what view is this and what’s remarkable here, again this is a view and what’s remarkable here is the mitral valve, take a close look at that mitral valve and look at the excursion of it. There is something called the EPSS, that definition is that the EPSS is the E point of the mitral valve to ventricular wall separation, lets simplify that a little bit, the E stands for Early ventricular filling via the mitral valve when the mitral valve was wide open, in other words, it’s the space between the anterior of the mitral valve and the septum, normally, the anterior of the mitral valve should almost slap the septum and this should be very little space, in fact, the distance between the mitral valve and the septum the EPSS, should be less than one centimetre, if it’s greater than two centimetres for example, the ejection fraction is considered to be less than thirty percent, now what’s the EPSS here, well, let’s take a look at the mitral valve, the image is now frozen and the mitral valve is sitting over here. On the scale over here to the right, going from the top of the screen down to the bottom, the scale is set so the depth is sixteen centimeters, each hatch mark from here to here, from here to here and so forth represents one centimetre, so this yellow bar is showing a two centimetre separation, in other words, if this separation between the anterior leaflet and the septum is greater than this, the ejection fraction is less than thirty percent. This lecture is entitled, test your sonography skills, the importance of this lecture is to illustrate how ultrasounds can be used for clinical decision making. 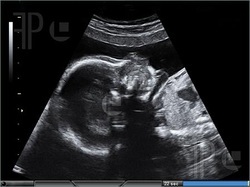 We are going to look at one particular case and see how the use of the ultrasound can influence your decision making. Now please be aware that there are many different ways to approach what is considered a complex case here and by no means am I saying that this is the only way to approach the case, again the purpose is to show how an ultrasound or in this case, more than one ultrasound, can influence clinical decision making, so we will start off with the beginning of the case. This is a sixty four year old male, septic from a urinary tract infection who has DIC and became short of breath requiring intubation, his base line chest X-ray and EKG were normal, his vital signs are remarkable for hypotension, tachycardia, and being specialist at thirty eight degrees, he is sedated from medications and in no acute distress, his lungs are remarkable for crackles, his heart has a systolic ejection murmur, his abdomen has decreased bowel sounds and is non tender. Bearing in mind however that he is sedated from medications making exams somewhat difficult, extremities are within normal limits and likewise for his neurological exam, there is no focal deficits but he is very sedated from medications and again the complete exam is somewhat difficult, the following tests were ordered, a chest X-ray was ordered, was performed on a stat basis and showed moderate congestive heart failure, an EKG was ordered and as soon as the EKG tech came to perform it, the patient was on the way to CT angiography and it was felt that that should be given priority so the EKG is still pending, the patient did come back and the CT angiography was negative for pulmonary embolism, once he arrived back, ABG, CBC, BMP, blood cultures, INR, PTT were drawn and are all pending. While waiting for the labs to return, a fluid challenge to complete and view his hypotension, you performed some tests with sonography and ultrasound, this is one part of the ultrasound, take a look at it and we will come back to it later but realize this is the view of the heart, left atrium, blood going through the mitral valve into the left ventricle, being pumped out into the aorta through the aortic valve and up here is the right ventricle, we will come back to this.